At NuFlow Oklahoma, we specialize in affordable, effective trenchless sewer repair solutions, bringing the power of new technology to our customers. Our patented pipe lining technology restores pipes to peak efficiency in the most low-hassle, environmentally-friendly way available today. Trenchless sewer repairs are a more modern way of restoring damaged pipes that eliminates the need for large-scale digging. Previously, the only way to replace a broken or leaking pipe was to remove all the soil covering and surface features, disconnect the damaged pipe, remove it, place the new pipe, reconnect it, refill the hole, and repave or re-landscape the property. This long process cost thousands to tens of thousands of dollars and disrupted the activities of the home or business for days or even weeks. It also created environmental impacts, with damage to animal and bird nesting areas, increased soil erosion, and large amounts of landfill debris. Today, NuFlow Oklahoma eliminates all that waste with our state-of-the-art trenchless sewer repair solutions. Rather than digging, our modern methods are introduced through small access holes, often as minimal as a few feet. We can typically complete an entire pipe coating or relining in as little as a day, dramatically reducing the impact on the household or business. With less labor and materials needed, our trenchless repairs are much more affordable than other methods, costing as little as 50% of a standard repair and eliminating costly damage to property features. Further, our technology is environmentally-friendly, protecting wildlife, soil, and water supplies from pollution while reducing landfill waste. To complete a trenchless sewer repair, we begin by fully inspecting the problem pipe to catalog all the damaged areas and determine the best method for restoring service in the least invasive, most economical way. Once we have a comprehensive understanding of the problem, we then clean the pipe using hydro jetting to scour away accumulated waste and create a pristine surface to which the epoxy can adhere. With the pipe prepared, NuFlow Oklahoma then applies the correct trenchless sewer repair depending on the nature and severity of the problem. If there is a small, pinhole leak in the sewer pipe, we may restore the pipeline with epoxy coating, a thin pipe-sealing veneer that is applied in liquid form using compressed air. This effective method completely seals minor leaks and micro-fissures, restoring the pipe to strength and improving water pressure. For more extensive damage, we will restore the problem drain with a cured-in-place pipe. We coat a sleeve with an epoxy resin, then position the sleeve in the pipe and inflate it to apply the epoxy to the interior of the sewer line, forming a new epoxy pipe against the interior of the faulty pipe. Over the next several hours, the epoxy cures, fully restoring the sewer pipe to better-than-new condition. If you need a sewer repair but don’t want to deal with a long, costly repair process, the trenchless sewer repair solutions provided by our experts at NuFlow Oklahoma are for you. 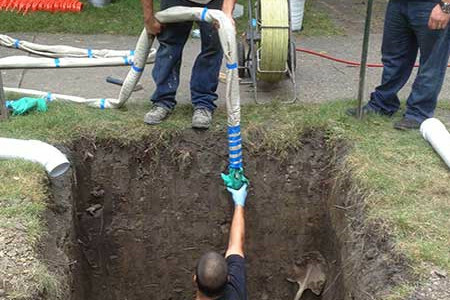 We can restore any damaged pipe to their optimal condition in a fraction of the time of the standard dig method. Call us today for your consultation!